Hi there! I’ve come back with this new entry in Newsletter format to share my favorites things about this past month, september. Links, readings, books, stuff, etc. I bought a blue electric mixer so I can make cakes more easily. Before I did it by hand and with the blessing of a fork. My boy gave me the book of Good night stories for rebel girls, super cute and cool. This book is special because it was the most successful Kickstarter project about a book in the web. Also, I got the new book from Frannerd and Eduardo Pavéz, Personas Favoritas, it's a big and really honest book about friendship as adults. Also the subject of the book has a Podcast, which you can listen to without the book. I had an amazing upgrade in my skin because of the new dermatologic treatment I'm doing. Make-up has never been so fun! 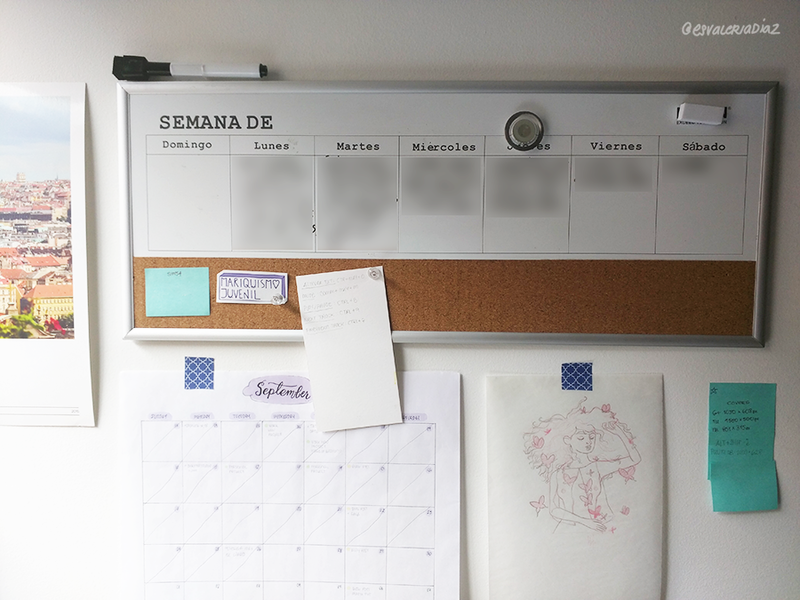 My boy gave me an acrylic board to organize my week and I love it. A mail with the best reply ever to the bullying business or clients. Colombian illustrator: you are putting an end to your own dream about living of your art (and mine too) is an entry that applies to everyone in the world. I love the "Tina Roth Eisenberg: Don’t Complain, Create" talk. The history of Jon Bugerman. Anxiety has a cool side and Adam J.K. tells you everything "That fun kind of anxiety lol"
The illustrated biography of Mike Lowery. The shoes inspired in Game of Thrones, they are beautiful. The Ipad Pro 10", apple pencil and the app astropad. So, that's all guys, comment if you liked this kind of content and which link you liked the most. I love Tina Roth's talk. I have in mind to make the post about my method of organization but I'm a little full with work and getting ready for Inktober. Speaking of it, are you ready? Do you have your list of prompts set? I have mine and I will do all inktober with ink wash, I'm excited and terrified. I’ll also leave here a special announcement, I want to buy a plane ticket for my dad so he can spend December with me in Bogota - Colombia (he lives in Venezuela and it’s been 2 years since we last saw each other). So, I will be selling all my Inktober original illustrations. I will give you all the process information in the post once it starts. Remember to also subscribe to the blog so you can receive notifications of the nexts entries and follow me on Instagram where I share not only illustrations, but also views from my office, where I stalk all puppies in the park that I have nearby.